What content will matter on the connected TV? The obvious answer is premium video, including movies and TV shows. Parks Associates' Digital Media Evolution II survey indicates that the basics (customized weather and traffic widgets) along with music and games will also be of interest. In fact, it is interesting to see the growth of consumer interest in gaming applications at the set-top box or connected TV. This space is starting to heat up, and companies such as Accedo Broadband and OnLive could be significant players. Of course, as Michael Lantz from Accedo Broadband reminded us at the CONNECTIONS US Conference, it's difficult to get consumers to pay for the games. So how will these services be monetized? Keep an eye on remote UIs. The concept of the "remote UI," which would provide a more consistent experience in search and discovery of content across different platforms, will be of significant interest to service providers and content owners. Securing the connected experience should go beyond the PC. At this year's CONNECTIONS Conference in Santa Clara, companies like Mocana remind us that security concerns will grow more prevalent as huge numbers of devices (including those aimed at M2M applications like smart meters) become more interconnected. Please join us for our upcoming CONNECTIONS Conference in Europe this November. Visit www.connectionseurope.com for more information. 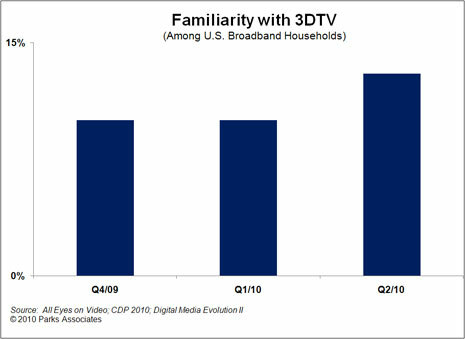 Parks Associates reports a modest increase in awareness of 3DTV among U.S. broadband households in 2010, but the mainstream viability of 3D depends on availability of premium video content and not one-off events such as the World Cup. The firm’s latest report Trends in 3DTV finds 13% of households are familiar with 3DTV, an increase from 10% from the previous quarter. In some cases, 48% of these households are willing to pay for 3D content, provided they have access to the right types of content, including movies and TV shows. Efforts such as the ESPN 3D broadcast of the 2010 World Cup are great experiments and effective in building awareness of the technology, but they have not resulted in extraordinary 3D TV sales. As content and service providers launch new 3D channels and Blu-ray discs, consumers will start to see more value in this technology, and shipments will increase as a result. By 2014, 80% of the TVs sold in the U.S. will be 3D-ready. Parks Associates research indicates 3D movies generate the most interest from U.S. consumers. One-third or fewer of consumers are willing to pay for 3D television shows and sporting events, but nearly one-half are willing to pay for 3D movies. Trends in 3DTV provides a detailed overview of 3D technology and examines business strategies by industry segment. The report analyzes the availability of content, reviews issues and progress with each content delivery method, and describes the impact of 3D on CE. Bill Ablondi, Director of Home Systems Research, Parks Associates is moderating the panel, "Providing Demand-Based Ancillary Services via the Smart Grid" at the Smart Grid V-Summit on July 29 at 4 PM. The Summer 2010 V-Summit will zero in on the perspectives of leading utilities, technology companies, systems integrators, and regulators in making the smart grid a reality. The emphasis is on real-world pilots, rollouts, and experiences from the field, with discussions led by key thought leaders and pioneers in the global smart grid industry. After buying Bewan Systems SA in March, Pace is now strengthening its telco residential gateway portfolio by buying 2Wire Inc. for an estimated $475 million. This will provide Pace, with entry into the U.S. market, as 2Wire has supported AT&T's triple-play and IPTV deployments for ten years. This acquisition is a clear example of the importance of home networking and managed services to today's service provider community. Is Google TV for real? Second, without the blessing of the pay-TV providers (DISH Network is the only service provider to work with Google TV), Google's search capabilities would be limited to the provider's program guide information and NOT assets like VoD titles. As the VoD libraries of the service providers grow, search and discovery is going to be more and more important - Joe Ambeault commented that Verizon constantly changes the title art and positioning of its VoD assets to encourage purchases. Google touts its TV solution as an open platform, but one has to wonder if the pay-TV providers will care. Verizon's approach has been to develop advanced TV features themselves. Let's assume that we start to see more provider-device relationships emerge such as the LG Electronics/Orange deal or Philips Net TVs and TeliaSonera VoD. In this case, could Google TV be useful? Sure, but the question is who controls the user interface and search functionality. I would think the operator would still want that control. To learn more about Google TV and other topics from the CONNECTIONS 2010 Conference, please subscribe to the Parks Points Newsletter. The Digital Entertainment Content Ecosystem (DECE) consortium has announced its UltraViolet consumer brand. The goal of UltraViolet is to allow consumers to watch their digital entertainment across multiple platforms, such as connected TVs, PCs, game consoles, smartphones and tablet PCs, in an easy, consistent way. Since all UltraViolet offerings will work together, consumers will be able to select which products and devices they prefer from a spectrum of familiar companies – ranging from major studios to consumer electronics companies to cable, web and other service providers. In addition, the UltraViolet name and logo will help identify entertainment products and services designed to work together seamlessly. In yesterday's Webcast on "TV Everywhere," I hypothesized that a "digital locker" solution such as UltraViolet (or perhaps something proprietary to the operator) would be a key in extending the concept of TV Everywhere from mere cable channel repllication to what I've termed "VoD 2.0," where operators create storefronts and are selling VoD downloads that can then be accessed on a variety of consumer electronics platforms. Eventually, I would expect that the concept of TV Everywhere then morphs into "Content Everywhere," where we see cloud-based solutions hosting a variety of content - from user-generated to professional (including games, e-books, music, etc.). But are the service providers on board with DECE? Although there are operators and service provider-related entities on DECE (CableLabs, Comcast, Cox, and Liberty Global), the comments I've read in news reports about the UltraViolet announcement are pretty noncommital about its use. In a post that I wrote after our CONNECTIONS™ 2010 event, where we had Mitch Singer (CTO of Sony Pictures and president of DECE) speak, I had expressed some concern about whether DECE would get traction with the service provider community. We heard concerns from service providers during CONNECTIONS™ that DECE's goal of limiting the number of video formats available would limit their ability to compete on higher and higher quality content. If a service provider is going to spend billions of dollars to upgrade their network to fiber or DOCSIS 3.0, shouldn’t they have the option of providing a very high-quality format that cannot be easily replicated by an over-the-top provider? I had announcements from Alcatel-Lucent and Sigma Designs this week regarding a Mediaroom-enabled solution aimed at smaller operators. The solution is aimed at supporting supporting networks of between 1,000 and 100,000 set-top-boxes. The solution not only provides high-quality television programming, but also enables new consumer media services through the blending and personalization of web and broadcasting content. This new offer, which uses a single equipment rack, supports more than three times as many households than previous versions of the Microsoft Mediaroom-based IPTV solution. Alcatel-Lucent will be deploying the first instance of its Integrated Solution for Microsoft Mediaroom for Cinergy MetroNet to potentially 50,000 customers in Indiana beginning July 26, 2010. Using the Mediaroom-powered solution, Cinergy MetroNet plans to offer its customers multimedia services such as broadcast TV blended with web content and the ability to simultaneously record multiple shows while watching another. Sigma Designs has established a new low-cost IPTV platform using the second-generation SMP8652 media processor to support lower-cost IPTV set-top box deployments. Conexant's reference design for "connected frames"
Conexant has an interesting announcement for a new reference design for Bluetooth-enabled "connected frames" for mobile phones. These products feature eight-inch LCD touch-screens and use Bluetooth technology to connect to a user's mobile phone. Applications supported include wireless hands-free speakerphone, phone book synchronizing, and mobile phone and headset pairing. The frames can also be used to wirelessly stream multimedia audio content from cell phones, and view and playback photos, audio, and video files in full- or split-screen mode. On July 13, Flextronics announced that is was resurrecting Firedog as a consumer and business-oriented technical support service. On Wednesday, Tech Support for Dummies, a new remote service with both one-time and subscription offerings, was announced. In Thursday's Wall Street Journal, there is a review of four remote tech support services - AskDrTech.com, AskPCExperts.com, BoxAid.com, and ComputerGeeksOnline.net. The development of remote online solutions will complement the growing premium tech support industry, including retailers and service providers, by providing improved marketing channels and enhancing automated and live support services. Parks Associates forecasts U.S. revenues in consumer-oriented technical support services will approach $5 billion by 2014, with roughly 50% of the revenues coming from remote technical support services. The development of remote services across a variety of channels, including broadband providers, Internet security vendors, PC OEMs, and CE retailers, will help meet the demand for premium technical support services, according to Parks Associates’ reports Service Providers and Support Services: Analysis and Forecasts and Retailers and Support Services: Analysis and Forecasts. Our research has consistently found that assistance with home technologies, including PCs, home networks, and AV equipment, is the top value-added service that a broadband provider can deliver. Consumer desire for ‘attached support’ – that is, additions such as extended warranties and protection plans, setup and configuration, delivery and installation – can also help retailers add revenue to the sale of a variety of CE. Aftermarket care in the form of PC tune-ups and troubleshooting provides a consistent and proactive form of technical care services. Service Providers and Support Services: Analysis and Forecasts and Retailers and Support Services: Analysis and Forecasts analyze the markets for U.S. consumer technical support services. These reports examine support offerings from service providers, retailers, OEMs, and third-party software and support vendors. They combine the results from more than 50 industry interviews and primary consumer data. NETGEAR has unveiled new products in the ReadyNAS family - the ReadyNAS® Ultra family of 2-Bay, 4-Bay and 6-Bay network storage systems. They incorporate some features that are very media server-centric, particularly the place-shifting capabilities with Orb Networks,compatibility with TiVo PVRs to stream HD programming content, and Skifta media-shifting capabilities so users can access their media from any DLNA certified device. Harry Wang, Director, Health & Mobile Product Research, Parks Associates will be moderating the panel, "Innovations in Wireless Technologies" on Monday, July 19th at 4:15 PM at the Seventh Annual Healthcare Unbound Conference & Exhibition in San Diego, CA. Wireless technology has a number of distinctive characteristics that make it an attractive platform for delivering healthcare anytime, anyplace. Though a number of real barriers remain to be overcome, perhaps no technology has a greater potential for transforming healthcare than wireless. This panel will explore this potential and describe what his happening now. Parks Associates is supporting Seventh Annual Healthcare Unbound Conference & Exhibition. The event is a nationally recognized event that focuses on networks, platforms and applications for technology-enabled participatory medicine. Key topics to be covered include innovative applications of remote monitoring, home telehealth, mhealth, ehealth and social media to manage diseases and promote wellness. This summer continues to be hot for announcements regarding connected consumer electronics and premium content services. A few weeks ago, the $9.99/month Hulu Plus service (with more than 2,000 television episodes available) generated the buzz, as it is available on a variety of connected TVs and Blu-ray Players (Samsung, Sony, and VIZIO), along with two game consoles (the Xbox 360 and PlayStation 3) and a variety of Apple products (iPod touch, iPhone, and the iPad). Today, the European news is about Panasonic making available content from Acetrax. The service will be available in Austria, France, Germany, Ireland, Italy, Switzerland, and the U.K. with titles likely to cost £1.49-£3.49 (€1.78-€4.17) to rent and £4.99-£11.99 to own. Users will be able to register up to four devices on one account. Parks Associates is supporting the 2nd Annual Leadership Summit on Wireless Health (WiHealth) on July 29th - 30th in Boston, MA. Parks Associates forecasts consumer demand for ubiquitous wireless access will make mobile broadband a common feature in portable CE, with 55% of the more than 100 million mobile Internet devices (MIDs) sold worldwide in 2014 containing embedded mobile 3G or faster connectivity. A new report Mobile Internet Devices: Uptake and Trends finds the majority of consumers consider wireless connectivity a necessity for devices such as e-readers, iPads, and portable game players. As a result, OEMs will incorporate mobile broadband into more devices, and to drive end-user adoption further, they could start to forge partnerships with mobile operators to develop innovative pricing models for mobile data services. The marriage of mobility and the Internet is creating excellent market opportunities. Connected PMPs, e-book readers, and Internet tablets will account for the majority of sales through 2014. For more information, visit http://www.parksassociates.com/mobile. Billboard and Adweek in Chicago welcome you to explore how the worlds of music and advertising are intertwined, and examine how big brands, artists and music supervisors are benefiting from working together during captivating keynotes interviews, informative case studies, and interactive panel discussions. For more information about Music & Advertising, click here.